TORONTO, ON–(Marketwired – May 03, 2016) – Continental Gold Inc. (TSX: CNL) (OTCQX: CGOOF) (“Continental” or the “Company”) is pleased to announce positive final reconciled results from the trial mining program completed along the San Antonio vein in the Yaraguá vein system at the Buriticá project, Colombia. JDS Energy & Mining Inc. (“JDS”) was retained to oversee the trial stope mining, processing of ore through Continental’s small-scale milling facility and verification of all reconciled results. 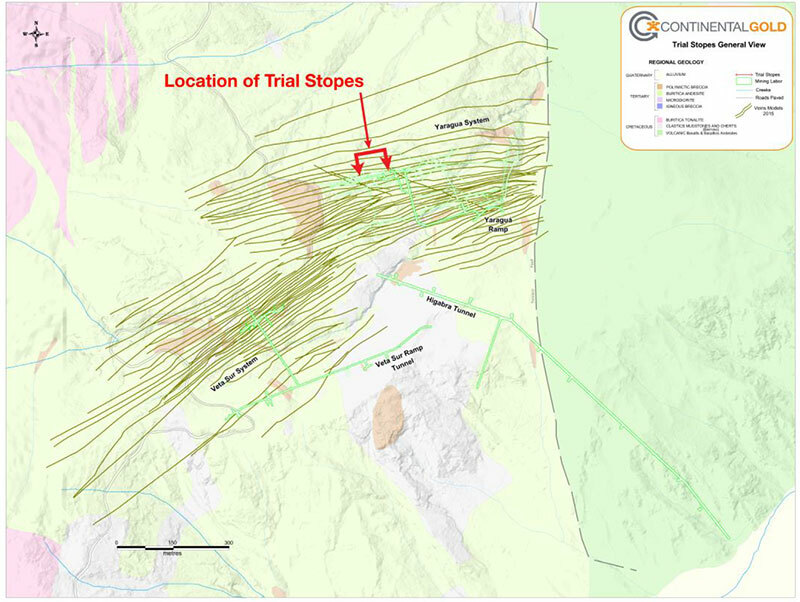 Results validated that the Feasibility Study’s stope design dimensions of 15 metres between sublevels and 30 metres along strike are viable without excessive ore loss or mining dilution. Also, rock fragmentation from blasting was excellent (Figure 3). In order to validate Feasibility Study mining method design criteria, JDS and the Company agreed that a trial mining test stope should be extracted from the Yaraguá deposit’s San Antonio vein (Figure 1). JDS developed all test stope procedures to be used during extraction, including design methodology, engineering, survey requirements and long-hole mining methodology. The two sequentially-extracted trial mining stopes were located within partially-oxidized rock approximately 80 metres below surface (1,545 RL to bottom sill sub-level); this was only 10 metres below the 70-metre weathered zone limit designated for cut-and-fill mining in the Feasibility Study (Figure 2). The San Antonio vein was selected for the trial mining stope because it is expected to contribute the most to future gold production from the Yaraguá system, and it is easily accessible from existing development as part of the Company’s small-scale operating mine. 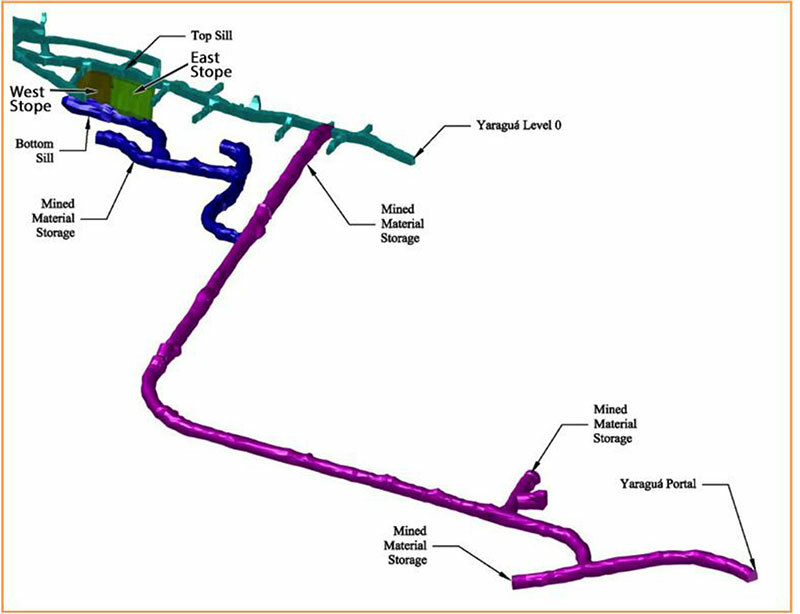 The trial mining stopes were designed based on the orientation and width of the San Antonio vein, as outlined in the most recent Yaraguá mineral resource block model prepared in accordance with Canadian National Instrument 43-101 (“NI 43-101”). The initial east stope design measured 11 metres drill height by 17 metres long by 1.8 metres wide, while the west stope measured 11 metres drill height by 12 metres long by 1.8 metres wide. The 1.8-metre width was determined by adding over-break of 0.3 metres to either side of the 1.2-metre-wide San Antonio vein. Subsequent sublevel channel sampling in both stopes showed high-grade gold mineralization over substantially broader widths when compared to the modelled 1.2-metre average width of the San Antonio vein domain in this area of the mineral resource envelope; this is due to veinlet sets oblique to the main vein margins (see Company press release dated February 4, 2016). Previously announced on February 4, 2016. Channel samples are taken across the roof of the underground drift and are spaced every one metre along the strike length. * Widths are true horizontal metres at a 0 g/t gold cut-off grade. ** Grade Capping for Gold: 120 g/; Silver: 1,000 g/t; Zinc: 16%. To accommodate the broader-than-anticipated high-grade gold mineralization, the east and west final stope designs resulted in average widths of approximately 2.3 metres (including 0.3 metres over-break allowance for each stope side). From the 2015 Yaraguá mineral resource model, mill feed from the combined final stope designs was estimated to be 2,022 tonnes at 15.9 g/t gold. The higher-than-anticipated grades and widths, when compared to the mineral resource model, reinforce the importance of definition drilling and channel sampling for grade control in order to complete final stope designs during production. Certain technical information in this press release is based upon information prepared by Gregory A. Blaylock, P.Eng. of JDS Energy & Mining Inc., a Qualified Person (as defined in the Canadian Institute of Mining, Metallurgy and Petroleum Standards on Mineral Resources and Reserves and NI 43-101) and independent of Continental. The technical information in this press release has been reviewed and approved by Donald Gray, Chief Operating Officer of Continental, who is a Qualified Person under NI 43-101 standards. Channel samples from the Yaraguá drift were prepared by ALS Colombia Limited of Medellín, Colombia and fire-assayed for gold and silver by ALS Perú S.A. of Lima, Peru, as well as assayed for other metallurgically-significant elements. Both ALS Colombia Limited and ALS Perú S.A. are independent of the Company. Process plant samples were prepared and assayed by SGS Colombia S.A.S. in Medellín, Colombia, which is independent of the Company. The Company utilizes a rigorous, industry-standard QA/QC program similar to that described in the Technical Report (defined below). For additional information on the Buriticá project, please refer to the Feasibility Study technical report, prepared in accordance with NI 43-101, entitled “Buriticá Project NI 43-101 Technical Report Feasibility Study, Antioquia, Colombia” (the “Technical Report”). The Technical Report, with an effective date of February 24, 2016 and dated March 29, 2016, was prepared for the Company by JDS. A copy of the Technical Report can be accessed under the Company’s SEDAR profile at www.sedar.com, or on the Company’s website at www.continentalgold.com. This press release contains or refers to forward-looking information under Canadian securities legislation, including statements regarding the results of the feasibility study, including, but not limited to, metal or mineral recoveries, the Company’s potential plans and operating performance; the estimation of the tonnage, grades and content of deposits, and the extent of the resource and reserves estimates; potential production from and viability of the Company’s properties; exploration results, potential improvement of mining dilution grades, future drill programs and studies, future channel sampling results, exploration and mine development plans, and future plans and objectives of the Company, and is based on current expectations that involve a number of significant business risks and uncertainties. Forward-looking statements are subject to other factors that could cause actual results to differ materially from expected results. Readers should not place undue reliance on forward-looking statements. Factors that could cause actual results to differ materially from any forward-looking statement include, but are not limited to, an inability to advance the Buriticá project to the next level, failure to convert estimated mineral resources to reserves, capital and operating costs varying significantly from estimates, the preliminary nature of metallurgical test results, delays in obtaining or failures to obtain required governmental, environmental or other project approvals, political risks, uncertainties relating to the availability and costs of financing needed in the future, changes in equity markets, inflation, changes in exchange rates, fluctuations in commodity prices, delays in the development of projects and the other risks involved in the mineral exploration and development industry. Specific reference is made to the most recent Annual Information Form on file with Canadian provincial securities regulatory authorities for a discussion of some of the factors underlying forward-looking statements. All of the forward-looking statements made in this press release are qualified by these cautionary statements, and are made as of the date hereof. The Company assumes no responsibility to update them or revise them to reflect new events or circumstances other than as required by law. This press release was prepared in accordance with Canadian standards, which differ in some respects from United States standards. In particular, and without limiting the generality of the foregoing, the terms “inferred mineral resources,” “indicated mineral resources,” “measured mineral resources” and “mineral resources” used or referenced in this press release are Canadian mining terms as defined in accordance with National Instrument 43-101-Standards of Disclosure for Mineral Projects under the guidelines set out in the Canadian Institute of Mining, Metallurgy and Petroleum (the “CIM”) Standards on Mineral Resources and Mineral Reserves (the “CIM Standards”). The CIM Standards differ significantly from standards in the United States. While the terms “mineral resource,” “measured mineral resources,” “indicated mineral resources,” and “inferred mineral resources” are recognized and required by Canadian regulations, they are not defined terms under standards in the United States. “Inferred mineral resources” have a great amount of uncertainty as to their existence, and great uncertainty as to their economic and legal feasibility. It cannot be assumed that all or any part of an inferred mineral resource will ever be upgraded to a higher category. Under Canadian securities laws, estimates of inferred mineral resources may not form the basis of feasibility or other economic studies. Readers are cautioned not to assume that all or any part of measured or indicated mineral resources will ever be converted into reserves. Readers are also cautioned not to assume that all or any part of an inferred mineral resource exists, or is economically or legally mineable. Disclosure of “contained ounces” in a resource is permitted disclosure under Canadian regulations; however, United States companies are only permitted to report mineralization that does not constitute “reserves” by standards in the United States as in place tonnage and grade without reference to unit measures. Accordingly, information regarding resources contained or referenced in this press release containing descriptions of our mineral deposits may not be comparable to similar information made public by United States companies. Figure 1: Plan View of the location of both trial stopes, showing the surface projection of veins in the current Yaraguá and Veta Sur mineral resource models on geology–topography and underground developments. Figure 2: Trial mining location (3D view looking northwest). 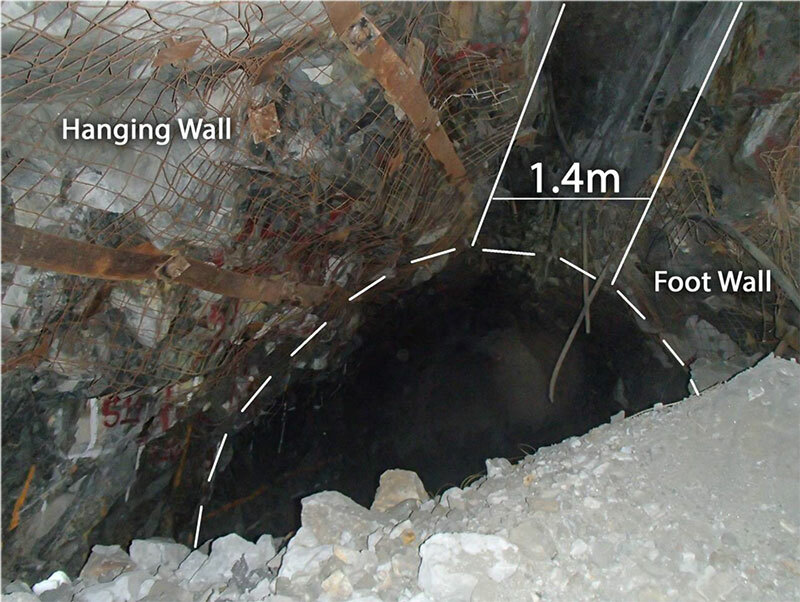 Figure 3: A photo of the trial stope demonstrating excellent blast control at approximately 1.4 metres horizontal width in this location and good rock fragmentation below.